If you have severe, chronic pain in your shoulder, an orthopedic surgeon can help. Dr. Mufaddal Gombera specializes in minimally invasive procedures that let you recover easily. 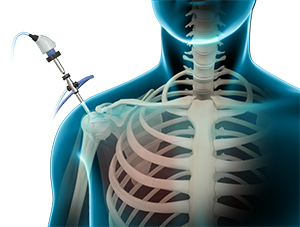 He can conduct an arthroscopy on your shoulder that involves only a few small incisions. You don't always have to have open surgery to relieve your shoulder problems. Dr. Gombera understands this and prioritizes using the least invasive methods possible. Thanks to modern technology, Dr. Gombera can offer minimally invasive care like arthroscopy. During a shoulder arthroscopy, he uses a small instrument called an arthroscope. This tool has a light and camera that shows him images of the affected joint. He only needs to make a few small incisions and insert the arthroscope to look at the problem. Once he finds the issue, he uses very thin instruments that also fit through the small incisions to treat it. Arthroscopy lets orthopedic specialists treat many conditions without a full operation. When Does a Patient Need Arthroscopic Shoulder Surgery? Your shoulder joint includes the head of your upper arm bone and the socket in your shoulder blade. These two bones connect to form the joint and have cushioning from the surrounding cartilage. Cartilage covers your arm bone and socket to let the bones glide freely when you move your arm. The shoulder joint also has ligaments and tendons that stabilize and support the rest of the joint. When injury or disease damage parts of your shoulder joint, they don't work together as they should. As a result, you can experience pain, inflammation and problems moving your shoulder. How Does Dr. Gombera Use Arthroscopy to Treat Shoulder Issues? When Dr. Gombera performs a shoulder arthroscopy, he'll give you general or regional anesthesia. General anesthesia makes you fall asleep during the procedure. Regional anesthesia numbs the area where he operates while you stay awake. He'll talk to you about your anesthesia options during a prior appointment. Once you can't feel the surgical area, Dr. Gombera will inject sterile fluid into your shoulder joint. This fluid expands the joint and gives him more room to see and work. Rotator cuff repair: If you have a damaged rotator cuff, Dr. Gombera will put it back together. He'll bring the tendon's edges back together. Then, he'll use small metal or plastic rivets to keep the tendon attached to your bone. These rivets stay in your shoulder after surgery, so you won't have to have another surgery for removal. Shoulder impingement therapy: Shoulder impingement inflames the tissue in your shoulder. This inflammation makes the symptoms more severe. Dr. Gombera will clean out any damaged tissue from your shoulder joint to help it heal properly. If you have impingement because of a growth on your acromion bone, he may shave it down so that it stops rubbing against your muscles. Shoulder instability treatment: You can have shoulder instability for multiple reasons. Dr. Gombera will address the cause behind your individual case. He'll repair the labrum, or the cartilage on the inside of your shoulder socket, if it has a tear. Any other cartilage and ligaments that have tearing and damage will also get mended. Once Dr. Gombera completes cleaning and repairs, he'll take out the arthroscope and tools. Then, he'll use small bandage strips with a strong adhesive that keeps your incisions closed. The surgery takes between 30 minutes and three hours to complete. In most cases, you can go home the same day you get the procedure done. Your experience with the surgery will depend on your diagnosis and the work done by Dr. Gombera. What Should I Expect During Recovery From My Arthroscopy Procedure? Will I Have a Good Prognosis After Arthroscopic Shoulder Surgery? Arthroscopy usually involves less pain, faster recovery and fewer complications than open surgery. However, your body needs time to repair itself after the procedure. If you had a treatment for shoulder instability, you might still have some instability after the arthroscopy. Your damaged rotator cuff or tendon won't hurt anymore, but it may not be as strong. Remember to follow Dr. Gombera's directions for self-care after surgery to ensure the best results possible. How Do I Schedule an Appointment With Dr. Gombera? Dr. Gombera sees athletes and non-athletes alike for their shoulder, hip and knee problems. No matter what you do in life for fulfillment, he'll find a solution for your pain that will get you back to doing what you love. Schedule an appointment today using our online booking tool, or call us at (713) 794-3457.